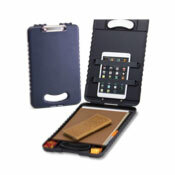 Secures tablet in place while storing papers documents and supplies in an ergonomic clipboard box with carry handle. Flexible security bands holds tablet firmly in place. Extra Wide Case. Flexible security bands holds tablet firmly in place. Removable LED light. Flexible security bands holds tablet firmly in place. Dry-Erase Board. Solar power calculator. Flexible security bands holds tablet firmly in place. Secures tablets safely in place while storing papers documents and supplies in an ergonomic clipboard box with carry handle. Ergonomic carry handle and grips. Three internal compartments. Holds letter/A4 size papers and documents. Strong low-profile metal clip. 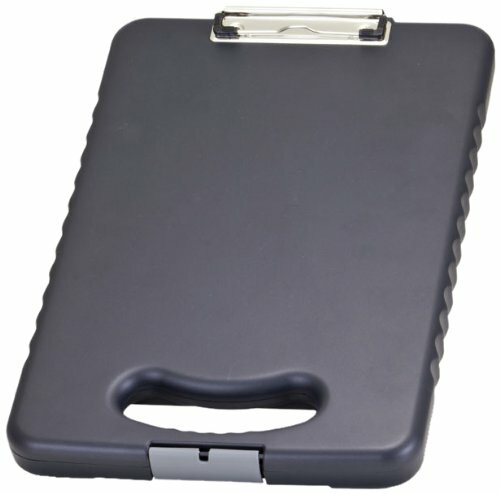 Bottom clasp locks case and protects its contents from weather, dust, etc. 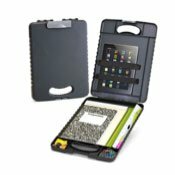 Secures tablet safely in place while storing papers documents and supplies in an ergonomic clipboard box with carry handle. Ergonomic carry handle and grips. Four internal compartments. Holds letter/A4 size papers and documents. Strong clip. Bottom clasp locks case and protects its contents from weather, dust, etc. 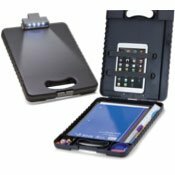 Secures tablet safely in place while storing papers documents and supplies in an ergonomic clipboard box with carry handle. Ergonomic carry handle and grips. Four internal compartments. Holds letter/A4 size papers and documents. Strong clip. Removable battery-powered LED light fits on top of the clip. Batteries included. Bottom clasp locks case and protects its contents from weather, dust, etc. 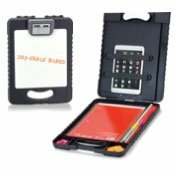 Secures tablet safely in place while storing papers documents and supplies in an ergonomic clipboard box with carry handle. Solar power calculator plus dry-erase board makes this case uniquely multi-functional. Ergonomic carry handle and grips. Four internal compartments. Holds letter/A4 size papers and documents. Solar power calculator doubles as clip. Bottom clasp locks case and protects its contents from weather, dust, etc. If you have any questions about this product by Officemate, contact us by completing and submitting the form below. If you are looking for a specif part number, please include it with your message.